I love maxi skirts year round and while I wear them in winter, they definitely get worn the most over the warmer months. I've got quite a collection of maxi skirts now, the majority of them are striped! I like the easy go-to outfit of a tee and a maxi skirt. Perfect for breastfeeding too. Navy and purple are so nice together. It's a combination I've worn a lot. When I got this skirt I knew right away I would wear it with this purple tee. Added the purple bag for a little more colour. Even though the purple shades don't match I really like the way it looks with the outfit. I was so happy with this, colourful and comfortable and perfect for our "viewing session" to review all of the photographs taken at the photoshoot I won a while back. There were so many great photos it was hard to narrow it down to what we wanted to buy! Last worn: purple tee, navy stripe maxi skirt, gold Havaianas, Rebecca Minkoff mini MAB tote bag. Other ways to wear: purple tee and pencil skirt, navy stripe maxi skirt worn two ways, Rebecca Minkoff mini MAB tote bag and winter layers. This was another style challenge outfit. The theme was 'matchy matchy' so I went with the navy tee to match the navy stripes in my maxi skirt. Again I wore the purple mini MAB tote bag as purple is so nice with navy! I wore this tee with purple last time I wore it too. Just wanted something simple and easy for baby boy's weekly weigh appointment, this was perfect. Last worn: navy tee, white maxi skirt, Havaianas, purple mini MAB tote bag (above). Other ways to wear: navy tee and a leather jacket, white maxi skirt with a green tank, purple mini MAB tote bag and flares. Linking up with Oh Hey Girl, Thursday Moda, Fashion Files, Fun Fashion, On The Edge, Flashback Fashion. Ooh no. I hope baby is doing ok now. Sending you so much love right now. Oh, no! I'm sorry to hear about your baby boy being in the hospital...I hope he will out as soon as possible. My husband had to receive a few IV last week because of a bad virus and infection but he refused to be hospitalized...stubborn man, now he is running around with fever. Sometimes it is better to spend a few days in the hospital and recover fully. Some things can be rushed. You look so lovely...both of these stripes skirts are adorable. Hope your husband is doing much better now! Stay encouraged! Praying for your son! 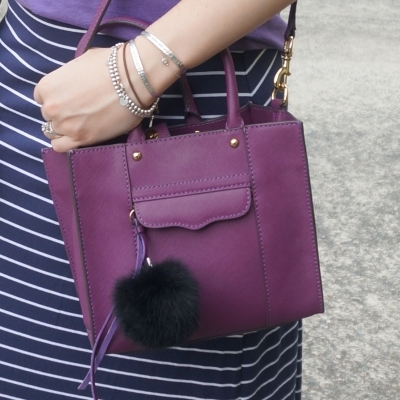 I really love the grape bag against the stripes! Beautiful! Thinking of you, hoping you most definitely get home for Christmas. More prayers for you and your family! A baby in the hospital is terrifying and I hope all of you are sticking together through this! <3 Stripes and navy tones are always a perfect look for summer! Oh, honey, I hope your baby boy will be okay - sending you good vibes all the way across the Pacific!! I love your maxi-matching with blues and purples - such a nice combination. Don't know if you saw my answer to your question about maxis dragging in winter - I hold a big bunch of the skirt in my hand to walk and keep the skirt from the wet sidewalks. I hope you and your baby are okay! I love the colors of these outfits! Sorry to hear baby boy is in the hospital! I do hope everything is well and you are all home for Christmas! Hope your baby is feeling a lot better soon!! Sending my love. This outfit is lovely, and your necklace completes the it!! I did notice on IG that you've been in the hospital, I'm hoping that everything is okay with baby boy and that you'll be able to go home soon! As for your outfits, you look beautiful, as always! I, too, love purple and navy paired together and you do it so well in these looks! Thanks for sharing, beauty, and again, I hope all is well! Oh goodness Mica, praying for your little boy and that he'll make a quick recovery! Hope everything gets better for you and your baby boy. Love Maxi Skirts too! Wishing your baby boy best of luck/health/everything. Hope you'll be all home for Christmas! Your second outfit looks lovely! I adore the elephant so much! Oh no, I hope your little one is okay! 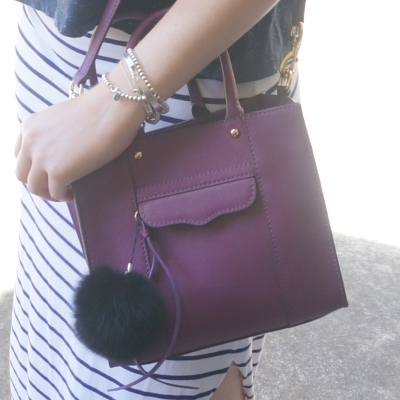 Love the striped skirt and pretty purple bag. I sure hope your son is fine now and will pray for him. I'm sorry your little one is in the hospital! Hope he is able to come home for Christmas! The navy and purple combo is so pretty! Hope your baby feels better soon! The skirt looks so comfy. That purple & blue look really good together Mica! I love that striped skirt. They look so good on you and so many types. Praying for your little one. I hope that baby boys is doing better. I really do like that purple bag, it looks like a useful size ie I can't overfill it...! I don't really own many purple things but I own a LOT of navy things so I'm thinking that's a good place to branch out to! Thank you all for your kind words and thoughts and prayers with baby boy's stay in hospital. We were thrilled to get to spend his first Christmas at home.